DUBAI (Reuters) - Iran said on Sunday it would expand its ties with Lebanon in spite of the "provocative and interventionist" call by U.S. Secretary of State Mike Pompeo for Beirut to choose sides, Iranian state television reported. On a regional tour to drum up support for Washington's harder line against Tehran, Pompeo said on Friday that Lebanon faced a choice - "Bravely move forward as an independent and proud nation, or allow the dark ambitions of Iran and Hezbollah to dictate your future". Iranian Foreign Ministry spokesman Bahram Qasemi dismissed Pompeo's remarks. "Because of the failure of its policies in the Middle East, America has turned to the outdated and disgraced weapon of threats and intimidation to impose its imperious policies on other countries," Qasemi said, state television reported. "While respecting the independence of Lebanon and the free will of its government and nation, Iran will use all its capacities to strengthen unity inside Lebanon and also to expand its ties with Lebanon." 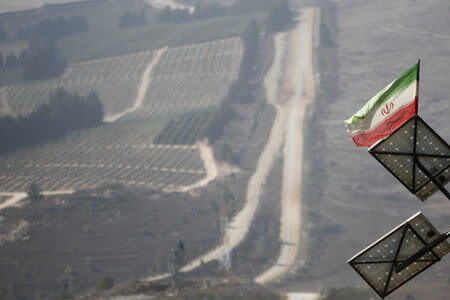 The dominant Shi'ite Muslim power Iran and Hezbollah, founded in 1982 by Iran's Revolutionary Guards, are major players in the war in Syria and the fight against militant groups opposed to President Bashar al-Assad, which include Islamic State. Qasemi said that Lebanon's Hezbollah was a legal and popular party. "How can Pompeo make such impudent and irrational remarks (about Hezbollah) while visiting Lebanon," he said.